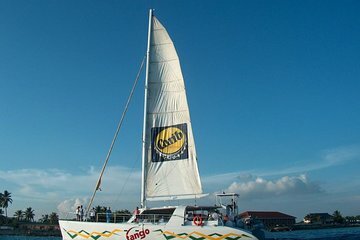 Sail by catamaran to Anguilla, visiting Shoal Bay and Cove Bay, on this full-day adventure from St Maarten. Leaving from Simpson Bay, cruise over to the nearby island and transfer to an overland vehicle to reach Shoal Bay. Set up your provided umbrella and lounge chair on one of the world's ten best beaches to enjoy the island scenery. Sip tropical drinks and munch on snacks, then dig in to a barbecue lunch before returning by land and sea to St Maarten. 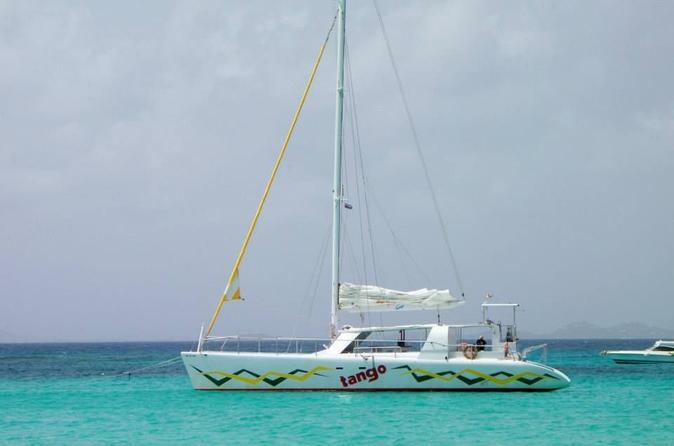 Head over to the Simpson Bay Resort to meet your guide and friendly crew aboard the Tango, a 63-foot (19-meter) catamaran. Climb aboard and find a spot to relax on the scenic ride to the nearby island of Anguilla. Help yourself to a snack; a French baguette with apples and Gouda cheese, or a drink from the open bar. Watch the island scenery glide by, soak up some rays and get to know your expert crew and fellow passengers. Go ashore at Cove Bay once you reach Anguilla. Meet your driver and climb into a comfortable vehicle for the trip to Shoal Bay, one of the world's top ten beaches. Enjoy views of Anguilla's unspoiled coastline and St Maarten in the distance during your drive. Once you reach Shoal Bay, sit back under your beach umbrella on a comfortable lounge chair and relax. Purchase nonalcoholic drinks, wine, rum punch or beer from the Sunset Beach Bar (own expense). When you're reach for lunch, enjoy a provided lunch of ribs or chicken. After a day of soaking up the sun, expanse of white sand and aqua waters, head back to the Simpson Bay Resort the way you came. Wow, what a great day. I'm not sure what more you could ask for except, maybe more time on the beach. The staff was wonderful and very accommodating. The trip was smooth sailing to Anguilla and after a short bus tour of Anguilla, we had some time on the beach and a delicious lunch, before a great sail back. Even an afternoon shower didn't put much of a damper on this day. The staff made sure that while you were on the catamaran you were not in need of a drink or snack. They did a wonderful job!!! Well done crew! Excellent sailing, absolutely beautiful beach, fun crew. The snorkeling was below average and they did not provide fins, just a mask and snorkel. Great day on the water but don't expect to see much snorkeling. Very well run trip. The crew was outstanding. Shoal Bay is gorgeous! Definitely would recommend. Tour was exactly as described. Not sure if it is always a rough ride heading to Anguilla, but it was our day. Service was good on board. Almost too good. Girls must have asked me 20 times if I wanted a drink. I said "no" 20 times. It was getting a bit annoying. Shoal Bay was beautiful, the drive was half hour up the coast. Captain was competent. Motored their and sailed most of the way back. Only other tidbit was tipping at the end. It was made clear to tip. Would take this trip again. Pick up from hotel on time, organized registration by local operator Aqua Mania. The crew was absolutely dedicated, cater to everybody's need and beyond, onboard as well as on shore. All staff was extremely pleasant and knowledgable, lunch was yummy, free drinks were flowing aboard the catamaran. Onto Anguilla, comfy air conditionned bus with sympatic driver, the island tour was fun with plenty of informations about local coutumes. Shoal Bay has pristine, fine sand, lots of sun chairs and almost 3 hours to snorkel...which was amazing. Equipment is included and snorkeling is right at the beach, really close, and beautiful.I would not only recommend this tour but I will do this tour again! Viator was great to deal with; I had a glitch in regard of St Barth tour which had to be cancelled, and Viator refunded with no hassles in a quick manner. I will book with Viator again. this is our third time to ST. Maarten and have been on 6 or 7 snorkeling trips this by far has been the worst. the money spent for three people is a lot. the crew was fine until you ask questions like how come you do not get fins with snorkel gear. or when viators ad says you get a beverage with lunch and they tell you your beverage was your welcome to the beach rum punch that you get one and one half hours before lunch. by the way my ten year old daughter is not allowed to have rum. but thanks for all the other snorkel trips as they were all 5 stars.